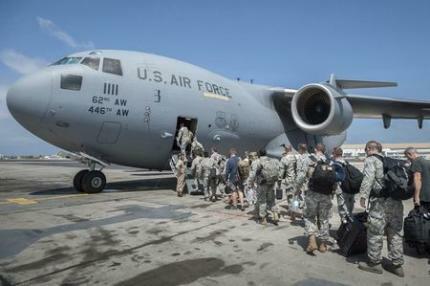 The air ambulance operation tasked with rescuing U.S. Ebola victims from West Africa was initially slowed by bureaucratic bungling and is now at risk of being overburdened as thousands of American troops deploy to fight the deadly disease. Yahoo News has learned the U.S. government spent millions last decade to develop and build two of the world’s only isolation chambers for flying contagious patients — but as the epidemic raged in West Africa this summer and American aid workers there needed evacuating, the medical inventions were packed away in a small-town Georgia warehouse. 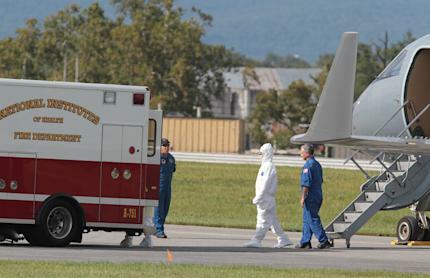 Click image to view entire contract for Ebola patient evacuations. The troubling lack of preparedness by federal agencies forced the State Department to put up $4.9 million as part of a rushed contract to employ a commercial aviator to safely evacuate Ebola-infected Americans from West Africa. 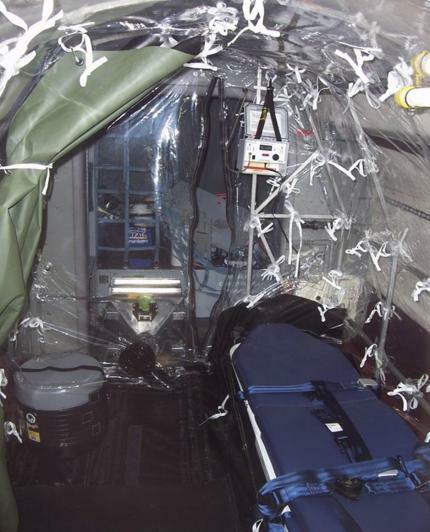 The Aeromedical Biological Containment System (ABCS), a tent-like structure that allows caregivers to treat a single patient in flight without infectious germs escaping, was engineered by the Centers for Disease Control, Department of Defense and a private flight company, Phoenix Air Group, between 2007 and 2010 after the scare over SARS, severe acute respiratory syndrome. The CDC paid Phoenix Air nearly $15 million between 2005 and 2011, according to a government database. Much of the money was spent to keep one of the company’s modified Gulfstream jets on retainer, in order to deploy the ABCS at a moment’s notice. The isolator was never used, and the CDC decided it could no longer afford to keep a jet on standby. So the agency — whose mission includes controlling the introduction and spread of infectious diseases in the United States — asked Phoenix Air to shelve the gear in 2011. By late July this year — with CDC workers and American aid volunteers in West Africa and the Ebola outbreak nearing its eighth month — the health agency had made no inquiries into its expensive life-saving equipment. It wasn't until Aug. 18 that the U.S. government had a contract in place to get the ABCS and Phoenix Air back on 24/7 alert status. The expedited agreement puts Phoenix Air on retainer through mid-January to transport Ebola-stricken patients at the State Department’s request. The exact cost of the deal could be more or less than the $4.9 million originally funded. The number of evacuations has already surpassed the three per month estimated in the contract. The lapse in medevac preparedness was brought to the State Department’s attention by Samaritan’s Purse, a Christian humanitarian organization desperate for guidance on how to transport gravely ill missionaries Dr. Kent Brantly and Nancy Writebol back to U.S. hospitals. Both were working at an Ebola clinic in Monrovia, Liberia, and started feeling ill around July 23. With few answers forthcoming from the CDC, the relief organization began phoning politicians and writing letters to spark action. “From all we have been able to learn, CDC does not have any existing procedures or protocols for management or reintegration of returning healthcare workers who have potentially been exposed to Ebola,” Samaritan’s Purse president Franklin Graham wrote to CDC director Dr. Tom Frieden. “This is a grave situation that needs the immediate attention of CDC,” Graham wrote in the letter, which was obtained by Yahoo News. Phoenix Air received its first call on July 25 from the State Department’s Division of Emergency Management “inquiring on the status of the ABCS,” Dent Thompson, the company’s vice president of operations, told Yahoo News. Another week passed before Dr. Brantly arrived in Atlanta on Aug. 2. The young doctor was the first person with Ebola ever to be brought into the United States, and was the inaugural passenger in the CDC’s high-tech transportation tent. Writebol followed a few days later. Their flights, however, were unique arrangements. As a standard practice, Phoenix Air said it wouldn’t normally accept a risky foreign medical assignment from a nongovernmental organization. But with the State Department contract still in the works and both patients in critical condition, the company agreed to the dramatic rescues, which reportedly cost Samaritan’s Purse about $400,000 in total. The CDC “does not have a direct mission in the evacuation of ill U.S. citizens,” Barbara Reynolds, the agency’s public affairs director, told Yahoo News by email. About 150 CDC staffers are currently working in West Africa, and the agency “has the capacity and plans for evacuation,” Reynolds wrote. The State Department’s public affairs office declined to comment on why the Aug. 18 contract painted the CDC and other agencies as unprepared for Ebola evacuations. But there have been no reports of U.S. residents dying while awaiting rescue in West Africa. Patrick Sawyer, a lawyer with dual citizenship in Liberia and the U.S., was living in Africa when he died from Ebola on July 24 at a Nigerian hospital. He was not a part of a rescue attempt. Yahoo News asked Dr. William Walters — one of five State Department officials who signed-off on the contract — which other Americans might have died while needing evacuation. Asked to clarify his response, Dr. Walters referred all questions to the agency's public relations department. The August contract was a lock for Phoenix Air, since the ABCS was built to fit inside two of its modified Gulfstream III jets. But the configuration only allows one patient per flight. The scrambling it took to save Brantly and Writebol quickly caught the attention of aid organizations that were already struggling to persuade volunteers to go into the hardest-hit areas. International Medical Corps, a Los Angeles-based global nonprofit group, has about 800 staffers fighting the disease in Liberia and Sierra Leone. Rabih Torbay, the organizations’s senior vice president for international operations, told a congressional committee in October that health care workers want to know there is a sound evacuation plan should they fall ill.
“This has been slow in coming,” Torbay testified. Beginning with Brantly, Phoenix Air has evacuated 15 patients with confirmed or suspected Ebola cases in the last 14 weeks. Two flights were the stateside transports of the nurses who contracted Ebola in Dallas. From West Africa, seven patients — five people with confirmed Ebola diagnoses and two with possible exposure — have been flown to U.S. hospitals. All have since been treated and released. The other six evacuations were patients not brought to the United States, the most recent being a UNICEF worker who was taken to France two weeks ago. Since setups like the ABCS don’t exist elsewhere, other governments and aid organizations have been piggybacking on the State Department's deal with Phoenix Air. Thompson, who expects the contract to be extended beyond January, said the workload has been stressful for the 250 employees of the Cartersville, Georgia-based aviation company. “You can’t stop when you have this kind of pressure and people’s lives are hanging in the balance,” he said. According to the State Department, the cost of the medical flights from West Africa to the United States has averaged about $215,000 a trip. Non-U.S. government rescues must be paid by the patient or their sponsoring organization. A private citizen can arrange an Ebola evacuation through American Citizens Services, a State Department office that helps U.S. citizens traveling abroad. Despite the global plea for all hands on deck, Canada said that given the problem of evacuating its doctors and nurses, it has decided not to send them to West Africa. “We do have an arrangement with the United States, but even their medical evacuation is limited,” Canada’s Health Minister, Rona Ambrose, said last month. International Medical Corps' Torbay implored Congress to learn from the dilemma. “While we welcome the advances that have been made over the past few weeks, … we recommend that the systems being put in place now be institutionalized and made part of the global preparedness planning in the event of future epidemics,” Torbay testified. Phoenix Air has only been flying only one plane at a time, with the second aircraft in emergency reserve. The jets go through a detailed 24-hour decontamination after patients are dropped off, which has left little room for maneuver in the schedule. A third jet currently being modified will soon allow Phoenix Air to maintain two aircraft ready for use. “As more and more people go over there, the odds of more than two people getting the disease simultaneously is going up,” Thompson said. The surge includes nearly 4,000 U.S. service members who will be in West Africa by year’s end. Troops already on the ground are building Ebola treatment units and a hospital for infected health care workers, and training communities in how to conduct safe burials of victims. Nearly 5,000 people have died from Ebola in Liberia, Sierra Leone and Guinea this year. 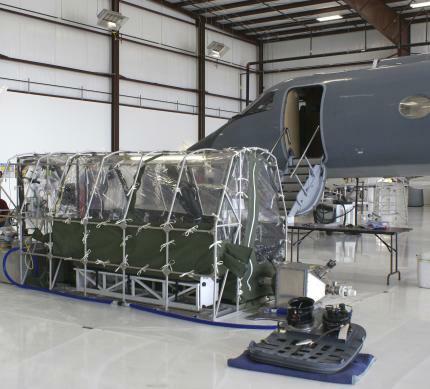 The military admits it will for now have to count on Phoenix Air to evacuate a sick soldier, but is hustling to assemble isolation chambers large enough to carry as many as 15 Ebola patients at a time on cargo planes. “In January?” quipped Rep. Patrick McHenry, R-N.C.